Panasonic has unveiled a host of new NFC-enabled products at CES 2014, including a durable 7-inch Windows 8 tablet, headphones, a premium digital compact camera, four HD camcorders and a range of smart home theatre systems. 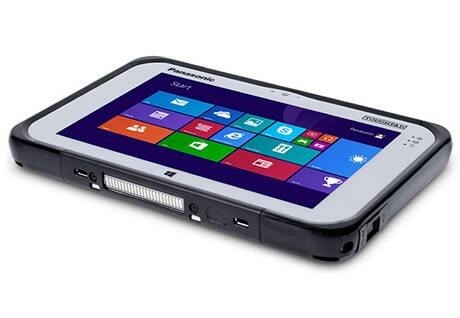 The Toughpad FZ-M1 will be available in early Spring 2014 starting from US$2,099 with an Intel Core i5 processor, 8GB RAM and 128GB SSD housed within its 0.7-inch thick rugged IP65-rated frame. The US$449 Lumix DMC-ZS40 super slim digital compact camera features an ultra-wide angle 30x optical zoom lens and 18.1 megapixel sensor and can connect to a smartphone or tablet via NFC and WiFi. This secondary device can then be used as a monitor to enable manual control of focus, zooming and shutter release. The four new NFC-enabled camcorders include the W850, which can shoot picture-in-picture video, as well as the slow motion capable V750, the V550 with 50x optical zoom and the compact V250. All four can use NFC to pair with a secondary device and can use Panasonic’s new baby monitor function. This allows the camcorder output to be viewed through a smartphone, allowing the user to watch their child from another room and even speak to the baby when it starts crying. The Bluetooth-enabled wireless RP-BTD10 headphones will be available in April 2014 for US$199, enabling consumers to easily pair devices through NFC to enjoy rich sound quality. NFC has also been included in the BTT465 and BTT405 Smart 3D Blu-ray Home Theater systems, HTB880 and HTB580 Home Theater systems and the SC-HC39 slim compact stereo system. The NFC functionality will allow consumers to quickly pair other NFC devices, such as headphones and smartphones, with one tap.